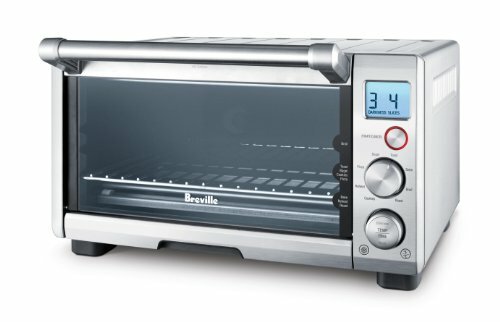 "Similar to the Breville Smart Oven, but in a smaller, more compact design, this 1800-watt oven offers exceptional cooking convenience while taking up less space on the counter. The unit's 3/5-cubic-foot nonstick interior can accommodate a 12-inch pizza or four slices of bread at a time, while its push-button and turn-knob control panel makes it easy to program. Turn the control dial to select the function--options include Toast, Bagel, Bake, Roast, Broil, Pizza, Cookies, and Reheat. The oven's Element IQ ""smart"" sensor technology puts the power where it's needed most to ensure energy-efficient operation. For each of the eight pre-set functions, Element IQ automatically adjusts the power and calculates the cooking time. The time and temperature for the pre-set programs can also be manually adjusted to accommodate individual preferences--the oven will even remember the new settings for next time. Use the second control dial for setting the time (from one minute up to two hours) and for adjusting the temperature (from 120 to 450 degrees F), as well as for selecting the number of slices and for setting the toast shade, from light to dark. The control panel also offers a large start/cancel button, a defrost button for frozen foods, and a temperature-conversion button for recipes with cooking temperatures in Celsius. The oven's easy-to-read backlit LCD screen shows the current function, temperature, and adjustments made--plus it illuminates orange to indicate preheating and cooking, then blue to indicate the end of the cooking cycle. Other highlights include a tempered-glass door, three rack positions, and a front-access removable crumb tray for quick cleanup. Accessories include a 10-by-10-inch enamel baking pan and a 10-by-10-inch enamel broil rack. Attractively housed in coated steel with a strikingly modern design, the countertop oven measures 16-1/2 by 14-1/4 by 10 inches and carries a one-year limited warranty. " Element IQTM puts the power where it's needed most. For each of the 8 pre-set programs, Element IQTM delivers the right power at the right temperature at the right time. And when adjusted for taste, it remembers that, too. 8 pre-set programs: Toast, Bagel, Bake, Roast, Broil, Pizza, Cookies, and Reheat. Backlit Easy-Read LCD calculates the correct time and temperature, illuminating orange during preheating and cooking and blue once the cycle is complete.